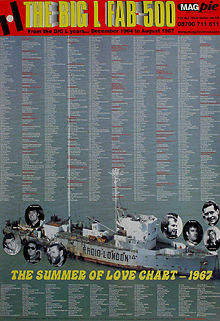 Big L Fab 500 Poster. The best 500 songs from the 'Big L' years. 1964- 1967. Plus a SUMMER OF LOVE 1967 chart - the top 100 songs from the famous 'Summer Of Love'. This giant A1 size poster contains pictures of the m.v. Galaxy and favourite Big L deejays from the 1960s.